In this Vietnamese name, the family name is Thích. According to Vietnamese custom, this person should properly be referred to by the given name Hạnh. Thích Nhất Hạnh (/ˈtɪk ˈnjʌt ˈhʌn/; Vietnamese: [tʰǐk̟ ɲə̌t hâjŋ̟ˀ] ( listen); born as Nguyễn Xuân Bảo on October 11, 1926) is a Vietnamese Buddhist monk and peace activist, founder of the Plum Village Tradition. Thích Nhất Hạnh spent most of his later life residing in the Plum Village Monastery in southwest France, travelling internationally to give retreats and talks. He coined the term "Engaged Buddhism" in his book Vietnam: Lotus in a Sea of Fire. After a long term of exile, he was given permission to make his first return trip to Vietnam in 2005. In November 2018, he returned to Vietnam to spend his remaining days at his "root temple," Từ Hiếu Temple near Huế. Nhất Hạnh has published over 100 books, including more than 70 in English. He is active in the peace movement, promoting nonviolent solutions to conflict. He also refrains from animal product consumption (veganism) as a means of nonviolence towards animals. Born as Nguyễn Xuân Bảo, Nhất Hạnh was born in the city of Huế in Central Vietnam in 1926. At the age of 16 he entered the monastery at nearby Từ Hiếu Temple, where his primary teacher was Zen Master Thanh Quý Chân Thật. A graduate of Báo Quốc Buddhist Academy in Central Vietnam, Thích Nhất Hạnh received training in Vietnamese traditions of Mahayana Buddhism, as well as Vietnamese Thiền, and received full ordination as a Bhikkhu in 1951. In the following years he founded Lá Bối Press, the Vạn Hanh Buddhist University in Saigon, and the School of Youth for Social Service (SYSS); a neutral corps of Buddhist peaceworkers who went into rural areas to establish schools, build healthcare clinics, and help rebuild villages. On May 1, 1966 at Từ Hiếu Temple, he received the "lamp transmission", making him a dharmacharya, from Zen Master Chân Thật. Nhất Hạnh is now recognized as a dharmacharya (teacher), and as the spiritual head of the Từ Hiếu Pagoda and associated monasteries. In 1961 Nhất Hạnh went to the US to teach comparative religion at Princeton University, and was subsequently appointed lecturer in Buddhism at Columbia University. By then he had gained fluency in French, Chinese, Sanskrit, Pali, Japanese and English, in addition to his native Vietnamese. In 1963, he returned to Vietnam to aid his fellow monks in their non-violent peace efforts. Nhất Hạnh taught Buddhist psychology and prajnaparamita literature at Vạn Hanh Buddhist University, a private institution that taught Buddhist studies, Vietnamese culture, and languages. At a meeting in April 1965, Vạn Hanh Union students issued a Call for Peace statement. It declared: "It is time for North and South Vietnam to find a way to stop the war and help all Vietnamese people live peacefully and with mutual respect." Nhất Hạnh left for the U.S. shortly afterwards, leaving Chân Không in charge of the SYSS. Vạn Hạnh University was taken over by one of the Chancellors who wished to sever ties with Thich Nhất Hạnh and the SYSS, accusing Chân Không of being a communist. From that point the SYSS struggled to raise funds and faced attacks on its members. The SYSS persisted in their relief efforts without taking sides in the conflict. Nhất Hạnh returned to the US in 1966 to lead a symposium in Vietnamese Buddhism at Cornell University, and to continue his work for peace. While in the US, Nhất Hạnh stopped at Gethsemani Abbey to speak with Thomas Merton. When Vietnam threatened to block Nhất Hạnh's re-entry to the country, Merton penned an essay of solidarity entitled "Nhat Hanh is my Brother". He had written a letter to Martin Luther King, Jr. in 1965 entitled: "In Search of the Enemy of Man". It was during his 1966 stay in the US that Nhất Hạnh met with King and urged him to publicly denounce the Vietnam War. In 1967, Dr. King gave a famous speech at the Riverside Church in New York City, his first to publicly question the U.S. involvement in Vietnam. Later that year, Dr. King nominated Nhất Hạnh for the 1967 Nobel Peace Prize. In his nomination Dr. King said, "I do not personally know of anyone more worthy of [this prize] than this gentle monk from Vietnam. His ideas for peace, if applied, would build a monument to ecumenism, to world brotherhood, to humanity". The fact that King had revealed the candidate he had chosen to nominate and had made a "strong request" to the prize committee, was in sharp violation of the Nobel traditions and protocol. The committee did not make an award that year. Nhất Hạnh moved to France and became the chair of the Vietnamese Buddhist Peace Delegation. When the Northern Vietnamese army took control of the south in 1975, he was denied permission to return to Vietnam. From 1976–1977 he led efforts to help rescue Vietnamese boat people in the Gulf of Siam, eventually stopping under pressure from the governments of Thailand and Singapore. A CIA document from the Vietnam War has called Thích Nhất Hạnh a "brain truster" of Thich Tri Quang, the leader of a dissident group. He established two monasteries in Vietnam, at the original Từ Hiếu Temple near Huế and at Prajna Temple in the central highlands. 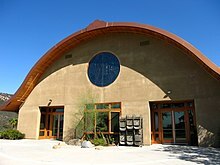 Thích Nhất Hạnh and the Order of Interbeing have established monasteries and Dharma centers in the United States at Deer Park Monastery (Tu Viện Lộc Uyển) in Escondido, California, Maple Forest Monastery (Tu Viện Rừng Phong) and Green Mountain Dharma Center (Ðạo Tràng Thanh Sơn) in Vermont and Magnolia Grove Monastery (Đạo Tràng Mộc Lan) in Mississippi, the second of which closed in 2007 and moved to the Blue Cliff Monastery in Pine Bush, New York . These monasteries are open to the public during much of the year and provide ongoing retreats for laypersons. The Order of Interbeing also holds retreats for specific groups of lay people, such as families, teenagers, veterans, the entertainment industry, members of Congress, law enforcement officers and people of color. Nhất Hạnh conducted a peace walk in Los Angeles in 2005, and again in 2007.
Notable members of the order of interbeing and disciples of Thích Nhất Hạnh include: Skip Ewing, founder of the Nashville Mindfulness Center; Natalie Goldberg, author and teacher; Chân Không, Dharma teacher; Caitriona Reed, Dharma teacher and co-founder of Manzanita Village Retreat Center; Larry Rosenberg, Dharma teacher; Cheri Maples police officer and dharma teacher; and Pritam Singh, real estate developer and editor of several of Nhất Hạnh's books. Other notable students of Thích Nhất Hạnh include Joan Halifax, founder of the Upaya Institute; Albert Low, Zen teacher and author; Joanna Macy, environmentalist and author; Jon Kabat-Zinn, creator of mindfulness-based stress reduction (MBSR); Jack Kornfield, Dharma teacher and author; Christiana Figueres former Executive Secretary of the United Nations Framework Convention on Climate Change; Garry Shandling comedian and actor; Marc Benioff founder of Salesforce.com; Jim Yong Kim, former president of the World Bank; John Croft, co-creator of Dragon Dreaming; Leila Seth, author and Chief Justice of the Delhi High Court and Stephanie Kaza, environmentalist. In 2005, following lengthy negotiations, Nhất Hạnh was given permission from the Vietnamese government to return for a visit. He was also allowed to teach there, publish four of his books in Vietnamese, and travel the country with monastic and lay members of his Order, including a return to his root temple, Tu Hieu Temple in Huế. The trip was not without controversy. Thich Vien Dinh, writing on behalf of the Unified Buddhist Church of Vietnam (considered illegal by the Vietnamese government), called for Nhất Hạnh to make a statement against the Vietnam government's poor record on religious freedom. Thich Vien Dinh feared that the trip would be used as propaganda by the Vietnamese government, suggesting to the world that religious freedom is improving there, while abuses continue. Despite the controversy, Thích Nhất Hạnh again returned to Vietnam in 2007, while two senior officials of the banned Unified Buddhist Church of Vietnam (UBCV) remained under house arrest. The Unified Buddhist Church called his visit a betrayal, symbolizing his willingness to work with his co-religionists' oppressors. Võ Văn Ái, a spokesman for the UBCV, said "I believe Thích Nhất Hạnh's trip is manipulated by the Hanoi government to hide its repression of the Unified Buddhist Church and create a false impression of religious freedom in Vietnam." The Plum Village Website states that the three goals of his 2007 trip back to Vietnam were to support new monastics in his Order; to organize and conduct "Great Chanting Ceremonies" intended to help heal remaining wounds from the Vietnam War; and to lead retreats for monastics and lay people. The chanting ceremonies were originally called "Grand Requiem for Praying Equally for All to Untie the Knots of Unjust Suffering", but Vietnamese officials objected, saying it was unacceptable for the government to "equally" pray for soldiers in the South Vietnamese army or U.S. soldiers. Nhất Hạnh agreed to change the name to "Grand Requiem For Praying". In 2014, major Anglican, Catholic, and Orthodox Christian leaders, as well as Jewish, Muslim, Hindu, and Buddhist leaders, met to sign a shared commitment against modern-day slavery; the declaration they signed calls for the elimination of slavery and human trafficking by the year 2020. Nhất Hạnh was represented by Sister Chân Không. In November 2014, Nhất Hạnh experienced a severe brain hemorrhage and was hospitalized. After months of rehabilitation, Nhất Hạnh was released from the stroke rehabilitation clinic at Bordeaux University Hospital, in France. On July 11, 2015, Nhất Hạnh was flown to San Francisco to speed his recovery with an aggressive rehabilitation program through UCSF Medical Center. He returned to France on January 8, 2016. After spending 2016 in France, Nhất Hạnh traveled to Thai Plum Village. He has continued to see both Eastern and Western specialists while in Thailand. He is still unable to speak. On November 2, 2018, a press release from the Plum Village community confirmed that Nhất Hạnh, now aged 92, had returned to Vietnam a final time and will reside at Từ Hiếu Temple to "live his remaining days". In a meeting with senior disciples, he had "clearly communicated his wish to return to Vietnam using gestures, nodding and shaking his head in response to questions." Thích Nhất Hạnh's approach has been to combine a variety of teachings of Early Buddhism, Mahayana Buddhist traditions of Yogācāra and Zen, and ideas from Western psychology to teach Mindfulness of Breathing and the Four Establishments of Mindfulness, offering a modern light on meditation practice. Hạnh's presentation of the Prajnaparamita in terms of "interbeing" has doctrinal antecedents in the Huayan school of thought, which "is often said to provide a philosophical foundation" for Zen. In September 2014, shortly before his stroke, Nhất Hạnh completed new English and Vietnamese translations of the Heart Sutra, one of the most important sutras in Mahayana Buddhism. In a letter to his students Nhất Hạnh explains that he wrote these new translations because he thought that a poor choice of words in the original text had resulted in significant misunderstandings of these core Buddhist teachings for almost 2,000 years. Nhất Hạnh has also been a leader in the Engaged Buddhism movement (he is credited with coining the term), promoting the individual's active role in creating change. He cites the 13th-century Vietnamese king Trần Nhân Tông with the origination of the concept. Trần Nhân Tông abdicated his throne to become a monk and founded the Vietnamese Buddhist school of the Bamboo Forest tradition. The Vietnamese name Thích (釋) is from "Thích Ca" or "Thích Già" (釋迦), means "of the Shakya clan". All Buddhist monastics in East Asian Buddhism adopt this name as their surname, implying that their first family is the Buddhist community. In many Buddhist traditions, there is a progression of names that a person can receive. The first, the lineage name, is given when a person takes refuge in the Three Jewels. Thích Nhất Hạnh's lineage name is Trừng Quang (澄光), meaning "Clear, Reflective Light". The next is a Dharma name, given when a person, lay or monastic, takes additional vows or when one is ordained as a monastic. Thích Nhất Hạnh's Dharma name is Phùng Xuân (逢春), meaning "Meeting Spring". Additionally, Dharma titles are sometimes given, and Thích Nhất Hạnh's Dharma title is Nhất Hạnh. Neither Nhất (一) nor Hạnh (行)—which approximate the roles of middle name or intercalary name and given name, respectively, when referring to him in English—was part of his name at birth. Nhất (一) means "one", implying "first-class", or "of best quality"; Hạnh (行) means "action", implying "right conduct" or "good nature." Thích Nhất Hạnh has translated his Dharma names as Nhất = One, and Hạnh = Action. Vietnamese names follow this naming convention, placing the family or surname first, then the middle or intercalary name which often refers to the person's position in the family or generation, followed by the given name. Thích Nhất Hạnh is often referred to as Thầy "master; teacher" or as Thầy Nhất Hạnh by his followers. Any Vietnamese monk or nun in the Mahayana tradition can be addressed as "thầy". Vietnamese Buddhist monks are addressed thầy tu "monk" and nuns are addressed as sư cô "sister" or sư bà "elder sister". On the Vietnamese version of the Plum Village website, he is also referred to as Thiền Sư Nhất Hạnh "Zen Master Nhất Hạnh". Nobel laureate Martin Luther King, Jr. nominated Thích Nhất Hạnh for the Nobel Peace Prize in 1967. However, the prize was not awarded to anybody that year. Nhất Hạnh was awarded the Courage of Conscience award in 1991. He has been featured in many films, including The Power of Forgiveness shown at the Dawn Breakers International Film Festival and the 2017 documentary Walk with Me by Max Pugh and Marc James Francis. Nhất Hạnh, along with Alfred Hassler and Sister Chân Không, became the subject of a graphic novel entitled The Secret of the 5 Powers in 2013. Nhất Hạnh has been chosen to receive 2015's Pacem in Terris Peace and Freedom Award. In November 2017, the Education University of Hong Kong conferred an honorary doctorate upon Nhất Hạnh for his "life-long contributions to the promotion of mindfulness, peace and happiness across the world". As Nhất Hạnh was unable to attend the congregation in Hong Kong, a simple ceremony was held on 29 August 2017 in Thailand, where John Lee Chi-kin, vice-president (academic) of EdUHK, presented the honorary degree certificate and academic gown to Nhất Hạnh on behalf of the university. Savor: Mindful Eating, Mindful Life. HarperOne. 2010. ISBN 978-0-06-169769-2. ^ a b c d Carolan, Trevor (January 1, 1996). "Mindfulness Bell: A Profile of Thich Nhat Hanh". Lion's Roar. Retrieved August 14, 2018. ^ Ford, James Ishmael (2006). Zen Master Who? : A Guide to the People and Stories of Zen. Wisdom Publications. p. 90. ISBN 0-86171-509-8. ^ Taylor, Philip (2007). Modernity and Re-enchantment: Religion in Post-revolutionary Vietnam. Institute of Southeast Asian Studies. p. 299. ISBN 9789812304407. Retrieved October 9, 2018. ^ a b c "Religion & Ethics – Thich Nhat Hanh". BBC. Retrieved June 16, 2013. ^ a b Johnson, Kay (January 16, 2005). "A Long Journey Home". Time Asia Magazine (online version). Retrieved September 13, 2010. ^ a b "Thich Nhat Hanh Returns Home". Plum Village. November 2, 2018. Retrieved November 2, 2018. ^ Samar Farah (April 4, 2002). "An advocate for peace starts with listening". The Christian Science Monitor. Retrieved September 13, 2010. ^ Joan Halifax, Thích Nhất Hạnh (2004). "The Fruitful Darkness: A Journey Through Buddhist Practice and Tribal Wisdom". Grove Press. Retrieved December 3, 2013. Being vegetarian here also means that we do not consume dairy and egg products, because they are products of the meat industry. If we stop consuming, they will stop producing. ^ ""Oprah Talks to Thich Nhat Hanh" from "O, The Oprah Magazine"". March 2010. Retrieved December 3, 2013. ^ a b c d e Dung, Thay Phap (2006). "A Letter to Friends about our Lineage" (PDF). PDF file on the Order of Interbeing website. Retrieved November 23, 2014. ^ Cordova, Nathaniel (2005). "The Tu Hieu Lineage of Thien (Zen) Buddhism". Blog entry on the Woodmore Village website. Archived from the original on January 12, 2013. Retrieved September 13, 2010. ^ "Thich Nhat Hanh". Published on the Community of Interbeing, UK website. Archived from the original on January 2, 2008. Retrieved September 13, 2010. ^ Bổn, Thích Đồng (December 23, 2010). "Tiểu Sử Hòa Thượng Thích Đôn Hậu". Thư Viện Hoa Sen (in Vietnamese). Retrieved November 20, 2018. ...in 1951 when he was transmission master at An Quang temple, in that transmission ceremony Ven. Nhật Liên, Ven. Nhất Hạnh…. were ordinees. ^ a b c d e f Miller, Andrea (September 30, 2016). "Peace in Every Step". Lion's Roar. Retrieved October 2, 2016. ^ a b Zahn, Max (September 30, 2015). "Talking Buddha, Talking Christ". Tricycle: The Buddhist Review. Retrieved October 1, 2015. ^ "Nhat Hanh is my Brother". Buddhist Door. May 1, 2011. Retrieved October 1, 2015. ^ Nobel Prize Official website "Facts on the Nobel Peace Prize. "The names of the nominees cannot be revealed until 50 years later, but the Nobel Peace Prize committee does reveal the number of nominees each year." ^ Nobel Prize website – Nomination Process "The statutes of the Nobel Foundation restrict disclosure of information about the nominations, whether publicly or privately, for 50 years. The restriction concerns the nominees and nominators, as well as investigations and opinions related to the award of a prize." ^ Steinfels, Peter (September 19, 1993). "At a Retreat, a Zen Monk Plants the Seeds of Peace". The New York Times. Retrieved August 13, 2018. ^ "Thich Nhat Hanh". Integrative Spirituality. Archived from the original on May 22, 2007. Retrieved September 13, 2010. ^  The Vietnam Center and Archive: "Situation Appraisal of Buddhism as a Political Force During Current Election Period Extending through September 1967"
^ "The Five Mindfulness Trainings". December 28, 2018. Retrieved December 28, 2018. ^ "The Fourteen Mindfulness Trainings of the Order of Interbeing". December 28, 2018. Retrieved December 28, 2018. ^ "Plum Village Community of Engaged Buddhism Inc. Web Site". Retrieved December 16, 2018. ^ "Information about Practice Centers from the official Community of Mindful Living site". Archived from the original on February 24, 2013. Retrieved March 9, 2013. ^ webteam. "About the European Institute of Applied Buddhism". Retrieved March 18, 2013. ^ "2016-2017 Annual Highlights from the Thich Nhat Hanh Foundation". Retrieved March 6, 2019. ^ a b "A Practice Center in the Tradition of Thich Nhat Hanh". deerparkmonastery.org. ^ "Colors of Compassion is a documentary film". Retrieved March 11, 2013. ^ "Article: ''Thich Nhat Hahn Leads Retreat for Members of Congress'' (2004) Faith and Politics Institute website". Faithandpolitics.org. May 14, 2013. Retrieved June 16, 2013. ^ Frank Bures. "Bures, Frank (2003) ''Zen and the Art of Law Enforcement'' – ''Christian Science Monitor''". Csmonitor.com. Retrieved June 16, 2013. ^ ""Thich Nhat Hanh on Burma", Buddhist Channel, accessed 11/5/2007". Buddhistchannel.tv. October 20, 2007. Retrieved June 16, 2013. ^ Warth, Gary (2005). "Local Buddhist Monks Return to Vietnam as Part of Historic Trip". North County Times (re-published on the Buddhist Channel news website). Retrieved September 13, 2010. ^ "Buddhist monk requests Thich Nhat Hanh to see true situation in Vietnam". Letter from Thich Vien Dinh as reported by the Buddhist Channel news website. Released by the Bureau of Democracy, Human Rights, and Labor, 2005. 2005. Retrieved September 13, 2010. ^ "Vietnam: International Religious Freedom Report". U.S. State Department. 2005. Retrieved September 13, 2010. ^ Kenneth Roth; executive director (1995). "Vietnam: The Suppression of the Unified Buddhist Church". Vol.7, No.4. Human Rights Watch. Retrieved September 13, 2010. ^ a b Johnson, Kay (March 2, 2007). "The Fighting Monks of Vietnam". Time Magazine (online version Retrieved July 3, 2007). Retrieved September 13, 2010. ^ "Pope Francis And Other Religious Leaders Sign Declaration Against Modern Slavery". The Huffington Post. ^ "Our Beloved Teacher in Hospital". Retrieved November 12, 2014. ^ "Thich Nhat Hanh Hospitalized for Severe Brain Hemorrhage". Tricycle: The Buddhist Review. November 13, 2014. Retrieved November 13, 2014. ^ "An Update on Thay's Health: 14th July 2015". Plum Village Monastery. Retrieved July 14, 2015. ^ "An Update on Thay's Health: 8th January 2016". Retrieved March 11, 2016. ^ a b c "On his 92nd birthday, a Thich Nhat Hanh post-stroke update". Lion's Roar. October 11, 2018. Retrieved October 11, 2018. ^ a b "New Heart Sutra translation by Thich Nhat Hanh". Plum Village Web Site. September 13, 2014. Retrieved January 29, 2019. ^ Duerr, Maia (March 26, 2010). "An Introduction to Engaged Buddhism". PBS. Retrieved August 14, 2018. ^ Hunt-Perry, Patricia; Fine, Lyn. "All Buddhism is Engaged: Thich Nhat Hanh and the Order of Interbeing". In Queen, Christopher S. (ed.). Engaged Buddhism in the West. Wisdom Publications. pp. 36–37. ISBN 978-0861711598. ^ "Title attributed to TNH on the Vietnamese Plum Village site" (in Vietnamese). Langmai.org. December 31, 2011. Retrieved June 16, 2013. ^ "Facts on the Nobel Peace Prize". Nobel Media. Archived from the original on August 5, 2012. Retrieved August 13, 2012. ^ "First line up". Dawn Breakers International Film Festival (DBIFF). December 5, 2009. Archived from the original on March 10, 2012. Retrieved September 13, 2010. ^ Marc J Francis and Max Pugh (Directors), Benedict Cumberbatch (Narrator) (July 18, 2017). Walk with Me (Motion Picture). 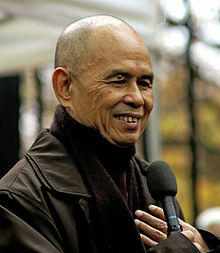 ^ "Thich Nhat Hanh to receive Catholic "Peace on Earth" award". Lion's Roar. Retrieved November 9, 2015. ^ Diocese of Davenport (October 23, 2015). "Pacem in Terris Peace and Freedom Award recipient announced". Archived from the original on March 16, 2017. ^ "The Education University of Hong Kong (EduHK) Press Release". ^ "The Education University of Hong Kong (EdUHK) Facebook". Wikimedia Commons has media related to Thich Nhat Hanh.